Jersey, where people went for sea air, tax avoidance or motor racing. It seemed very odd that this could happen there; in the Isle of Man and in Ireland, yes, but not on what was officially British soil. Fortunately, some very good and important races were held at these permitted locations. 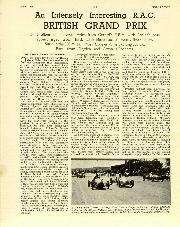 From 1933 to 1935 the Mannin Mor and Mannin Beg were held in the IoM, as I have described previously in Motor Sport, and Light Car races in 1936 and 1937, all important events which had the blessing of the RAC. 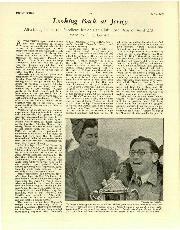 After the war years the IoM was at it again, when the BRDC staged its Castletown Trophy and Manx Cup contests from 1947 to 1951. In spite of the financial benefit to the Island which accrued from the almost immemorial annual TT motorcycle racing, the IoM authorities saw value in permitting car racing as well. Becoming aware of this Jersey decided to indulge in this modem and exciting experience in competition with the other island domain. 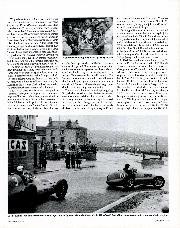 From 1947 on the inhabitants of St Helier either put up with, or rejoiced in, the influx of money-spending crowds that came there to see or compete in the car racing organised by the ambitious Junior Car Club (which from 1949 became the British Automobile Racing Club, able to use the famed initials BARC after war had gutted Brooldands Track). 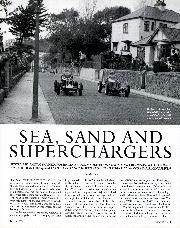 Jersey was able to offer street racing on a 3.2-mile circuit through the seaside resort of St Helier. Visitors arrived for the first race there in 1947 by the existing sea crossings, the air services or by charter flights and in private aeroplanes. 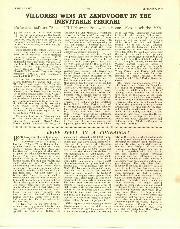 The race had been well publicised, in Motor Sport and elsewhere. The Jersey MC&LCC had raised £1,000 prize money, and when it was announced that the entry for the race on May 8 already included 10 Maseratis and 10 ERAs excitement rose. It was to be run under International GP formula rules for supercharged cars of up to 1 1/2 litres and non-supercharged cars up to 4 1/2 litres. We predicted Chiron or Sommer would win the 160-mile contest, or, if they didn't arrive, Raymond Mays or Reg Parnell. Practice was on the preceding Tuesday and Wednesday evenings from 7.30pm, when Prince Bira's Maserati clocked 2min 6.6sec. All three Scuderia Milano Maseratis, driven by Sommer, in a twin-blower car, Chiron and Pagani, lapped in 2min lOsec. Pamell's Maserati managed a mere 2min 18sec, but Leslie Johnson in his 4-litre sports-type Darracq put up a notable 2min 17sec, quicker than the three Delage cars of Ecurie Gersac,led by Louis Gerard, these drivers under orders as to their finishing positions. The Delahaye was even slower. Peter Whitehead in the E-type ERA created speculation but the fuel tank split, the contents being allowed to pour into the drain over which it had stopped. The course consisted of two main straights, the long downhill one leading to the very acute, badly cambered West Park hairpin, where Mays and Johnson corrected slides with full-opposite lock. The other link ran along the front to Le Marquand's Corner, with a kink at Bellview before it. John Morgan of the JCC was Clerk of the Course, aided by enthusiastic but inexperienced volunteers. So, a clean start, the front row occupied by Sommer, Chiron, Bira and Pagani. Sommer relieved Pagani of his lead before they reached the slow Bayview Hotel hairpin. Bira was then two seconds behind, followed by Pagani and Parnell. Sommer set a record fastest lap of 2min 6.2sec (91.28mph) but, as he had predicted, the Maserati's engine gave up after three laps. Bira led until he had to stop for a wheel change and Chiron took up this position. Unfortunately, the loudspeakers and the scoreboard gave Parnell as leading, and he was flagged in as the winner, Chiron second, Raymond Mays third. The Italians made their feelings loudly known! It seems that Parnell's pit-signals made him sure he was ahead, and Chiron had been flagged to go more slowly, his pit assuming he was winning. There was another muddle at the prize-giving. Bira, who had retired, was given the fastest-lap award even though he had done this in practice, while Sommer got nothing for fastest race lap. Chiron said, in French, at the prize-giving that he thought he had won but would abide by the Stewards' decision. The lap times did appear to give Parnell his victory, Chiron second, Mays third. The next three places went to Joe Ashmore (ERA R1A), Henry Louveau (Delage) and Johnson (Darracq). Pamell's speed was 84.52mph. The E-type ERA was out with an unspecified trouble, excused as a further fuel tank split; John Bolster in Peter Bell's ERA R5B was slowed when a plug lead came off making him think a piston had melted. Gilby's ex-Rayson Maserati baulked others. Wilkinson did most of the driving of Billy Cotton's ERA, Brooke's ERA R7B shed rods, and Chorlton, in the absent Harmer's T51 Bugatti stopped with no oil in the engine. Only Parnell completed the full 50 laps. 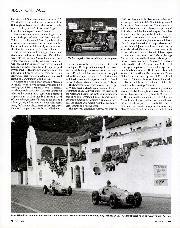 Jersey had had its first motor race. 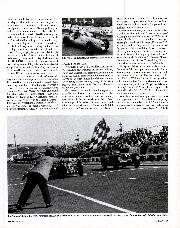 In 1948 the race distance was increased to 176 miles, or 55 laps. Entries included Luigi Villoresi's Scuderia Ambrosiana two-stage 16-valve Maserati, George Abecassis' Maserati, Reg Parnell's Maserati with outboard extra fuel tank, in the hope of a nonstop run, Prince Bira's Maserati with Fsson Scott in his pit, Ansell's ERA R8B, John Bolster with Bell's lowered ERA R5B, brother Ansell's ZF-diff Maserati, Salvadori's Maserati, Ashmore's A-type ERA, the B-type of Bob Gerard with large fuel tank, Harrison in ERA R8C and Heath's F2 Alta. Raymond Mays' ERA was flown over in a Dakota, Hampshire brought his Wilson-gearbox Delage, while Robert Cowell's V12 Lagonda had a new off-set singles-eater Egharn body. Baird was in Emeryson's latest Special with the ex-Seaman/ R Duller 41/2-litre straight-eight Duesenberg engine, and Baring had a Maserati. Non-starters were Sommer's CTA, Woodhall's Delage with a broken con-rod, Tony Rolt's eight-carb Alfa Romeo, due to cracked valve seats, the E-type ERA, Chorlton's Bugatti, Ian Connell's Darracq and Brooke's Ferrari. Practice was almost more interesting than the race! Bira lapped in 2min 1.4sec, 0.6sec faster than Villoresi, Gerard in 2min 8.6sec. A gearbox defect in Villoresi's Maserati caused his mechanics and two Italian waiters to work frantically as the race was about to start, ignoring the National Anthem. Bira led the race until he stopped for a wheel change and fuel, costing him 95sec. Parnell then went into the lead until Gerard took him, to lead by four seconds after 25 laps, Abecassis third. Bob went on building up an ever-increasing lead, but Pamell's expectation of not having to stop was spoilt by tyre trouble. The first two laps were agony for Bob, as his oil gauge registered zero, but it then recovered. There was now no stopping him, his pit calm, Mrs Gerard timing a faultless run. Villoresi had retired early, Baring's Maserati eventually stopped with supercharger hose-pipe breakages, as did the E-type ERA after lots of stops, at 24 laps, Brooke's ERA at 41 laps with a burnt-out valve, and Harrison's ERA R8C with a retarded magneto. But Cowell's Lagonda, Bennett's ex-Lord Selsdon Talbot, in spite of having no top gear and a faulty gasket, and Richardson's ERA-Riley got in, taking the last three places, ninth to eleventh. Mays' ERA R4D stopped with no oil to its Zoller blower. 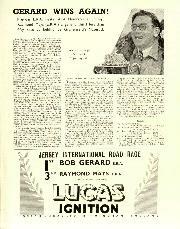 Gerard was clearly the Jersey hero, with a best race-lap of 90.42mph, after a magnificent drive, winning at 87.33mph. Abecassis was second, a lap down, Parnell third, Bira fourth after too many pit calls, all three a lap in arrears. R E Ansell's Maserati with Bolster were another lap down, and G E Ansell (ERA R9B) and Salvadori managed only 51 laps. The Emeryson's power was too much for its type 75 Wilson gearbox, Heath's Alta retired with a broken timing chain, Gilby fell out of his Maserati at the Marquand hairpin, the car then indulging in a race of its own, writing off one of Klemantaski's expensive cameras, just avoiding Klemantaski himself, and ending up against a Vauxhall in a garage yard. Safer to be a golfer, perhaps? 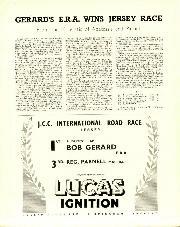 This now well-established race was run again in 1949, over the same 50-lap distance, and Bob Gerard scored again with his faithful ERA R14B against stiff Maserati and Ferrari opposition. The weather was misty with torrential rain so the start was postponed half an hour, and the chartered Airspeed Consul 65 in which land photographer Michael Tee had started from Croydon turned back when the radio failed. Practice was a sad affair, because Kenneth Bear's Type 59 Bugatti crashed at Le Marquand corner and he was fatally injured; a policeman and a doctor were also killed. Other non-starters were Leslie Johnson's ill-fated E-type ERA, which broke a piston after a very impressive lap of 93.21mph, Baring's Maserati with a cracked head, Watson's Ferrari, Claes' Talbot, Logan's Cooper and Chorlton's CDL which had arrived in a Miles Aerovan. Louis Chiron had come again in spite of the disappointing experience he suffered the year before. The front row of the grid was occupied by Villoresi, Bira (Maserati) and Chiron (Talbot) with respective lap times of 96.0, 94.0 and 83.2mph. At the start, however, it was Chiron who led, Bira second, Baron de Graffenreid third, in the latest 16-valve two-stage Maserati. Bira soon took the lead, his standing-start lap accomplished at 82.16mph, Villoresi not far behind, Chiron third, hard-pressed by Parnell's Maserati. The foul weather did not agree with Villoresi's Maserati, and changing carburettor jets and blanking off the radiator proved no cure, but the soaked, grimy and disconsolate Luigi pressed on, changing plugs as required, but not smiling as he had been before the start; he had some consolation, a fastest race-lap of 90mph, before the rain really set in. Parnell was the first to retire, with an unwilling petrol pump. Then Abecassis' Alta stopped for good with back axle derangement, Le Gallais' Talbot lost top gear, and Chiron was troubled by a locking rear brake. Heath was a frequent visitor to his pit with the Alta, which Bira had lapped. Bira made a very neat pit stop, getting out of the car while it was being refuelled, and Holgate was putting a wet finger on the plugs to see if any wished to be replaced. With 25 very slippery laps gone Bira led at 82mph but at its stop on lap 29 Gerard and de Graffenreid both went by, Gerard with a C-type fuel tank in his old ERA R14B to ensure another non-stop race and now leading by some 600 yards. Hamilton's Maserati stopped with a hole in the radiator, Mays took fourth place from Bolster when the latter's twin-Jamieson blower ERA was stopped with a damaged valve. So the miserable race ran to a close, Gerard getting round at nearly 77mph in the trying conditions. He crossed the finishing line after 2hr 16min 58.6sec, an average speed of 77.10mph , to receive with a smile a very large winner's cup. De Graffenreid was second, in 2hr 18min 39.2sec (76.16mph), Raymond Mays third in his well-known sprint 1 1/2-lite ERA R4D, in 2hr 19min 25.8sec. Next home were Bira, Ashmore and Villoresi in the three Maseratis, followed by Whitehead's Ferrari, Hampshire's ex-Bira Maserati, R E Ansell's Maserati, David Murray's Maserati, G Ansell's Wade-supercharged ERA, R9B, and the Alta. The 1950 race was much better. Rain gave way to a sullen sun, the girls wore beach attire, bicycles were taxed, purchase-tax-free new cars plentiful, press support for the race excellent and the St Helier Bay setting ideal. But a sliver of interest was removed when the works Maseratis of Chiron and Rol did not arrive. Lord Howe introduced the drivers to Jersey's Lieutentant Governor. The only non-starters were Logan's Cooper 1000 and Butterworth's frontwheel-drive AJB, but Merrick's Cooper only just qualified, with a 72.45mph lap. Over a course requiring speed and durable brakes David Hampshire achieved fastest practice lap of 94.12mph in a Scuderia Ambrosiana 4CLT Maserati. Peter Whitehead's V12 1½-litre Ferrari managed 93.51mph, Gerard's ERA 92.6mph, Harrison's ERA R8C 92.31mph, so they were on the front row of the grid. Peter Whitehead then drove an impeccable race, winning very comfortably indeed at a record 90.94mph, finishing a lap ahead of Parnell's Maserati and de Graffenreid's Maserati. Gerard (ERA) was fourth, Shawe-Taylor (ERA) fifth and Hampshire set quickest race lap at 94.94mph. This splendid drive by the calm red-faced farmer from Arborfield was a pleasure to watch, Motor Sport having made the journey to Jersey and back in a Transair Avro Anson. The fast course took its toll of Rolt in Walker's famous old Delage, with a split inlet manifold. Murray's Maserati retired for the same reason, as did both Coopers with broken pistons, Hampshire's Maserati with magneto failure and Harrison's ERA R8C. De Graffenreid lost eight minutes in two stops for oil. Whitehead won three trophies and £350, plus starting money. Due to financial losses the Jersey race was only resumed once, in 1952, and then as a sportscar race in heats and a final, won easily by Ian Stewart in a new Ecurie Ecosse Jaguar XK120C.